ALL INCLUSIVE RATES- Oceanfront 4-Bedroom W/ Private Pool! RATES INCLUDE: Departure maid service, linens, damage waiver, and all taxes. HOUSE DESCRIPTION:Welcome to A Vista Del Mar! Gorgeous interiors and fabulous unobstructed Ocean Front views. A Vista Del Mar just might permanently raise the standard for your future vacations. After you see the four bedrooms, sunshine-filled living room, and fully-equipped kitchen, you will likely not settle for anything less. A spacious and serviceable floor plan, calming coastal décor, and high-end furnishings represent only a few of the reasons so many people choose A Vista Del Mar. 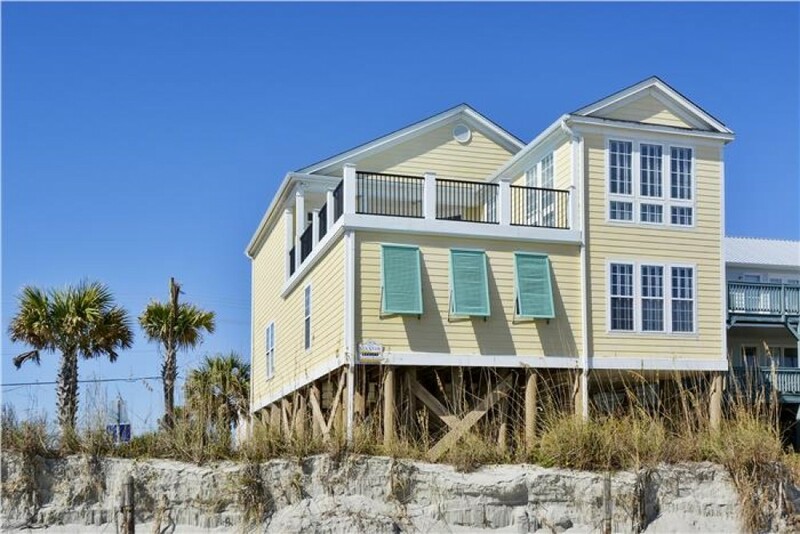 This home is ideally situated in Garden City Beach just south of Surfside Beach. Prepare meals in the fully equipped kitchen. There are six flat screen televisions, two DVD players, and high speed Internet access for your entertainment - if you can stand to leave the pristine sandy beaches Garden City has to offer! Your family can enjoy a million-dollar view easily observable from the home's private balconies. Wade in the ocean, relax in the convenient pool that is just steps off of the living area, or just bask in the warmth of the sun. Since Vista Del Mar sits directly Ocean Front, it's easy to sprint inside for a refresher beverage, a snack, or a fresh towel. Garden City is a nice, family oriented beach. The famous Garden City Beach Pier which offers fishing, live entertainment, food, ice cream, and much more. Excellent restaurants, unique shopping, beautiful golf courses, and excellent seafood located right here in Garden City. Myrtle Beach is just a twenty minute drive for unlimited entertainment, shopping, and restaurant options. Rates provided are ALL-INCLUSIVE, all taxes, fees, departure maid service, and linens. My friends and I had a great time.the. The house is wonderful and I hope I can get it every year. Good location and the best view of the beach. We had a great time, great house, and great location!! We rented this house for a long period, almost 7 weeks from late January 2017 to mid March 2017. The home is just as described and then some. While we were fortunate with amazing weather, even if it's not that warm the sun shines on the deck in the afternoon and even coolish days feel amazing. Had a few minor issues over our time but nothing serious and the team at Sea Star were prompt,friendly and always willing to help out. Very close to area restaurants and close to Myrtle Beach but far enough away as well. The immediate neighbourhood around this home is fantastic and we explored it a lot. Cannot wait to go back. Very relaxing and very comfortable. Kids lived the pool and being right next to the ocean was amazing. Plan on returning next year.